An artificial intelligence (AI)-powered helping hand is now available on all Android phones. 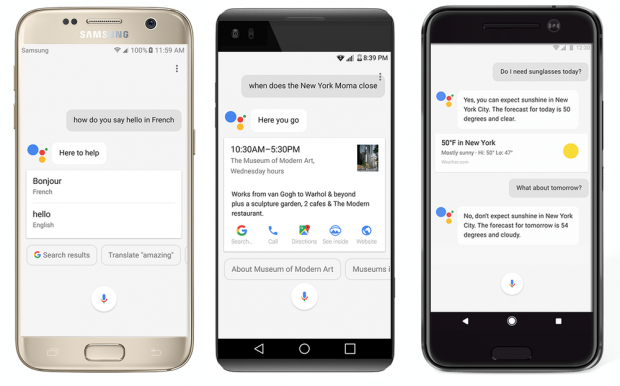 Already offered on Google Inc.’s Pixel phones, Home personal assistant, Allo messaging app, and Android wear devices, Google Assistant will be available on all smartphones running Android 7.0 Nougat and Android 6.0 Marshmallow starting this week, the company has announced. The AI-based personal helper will be rolled out to English users in the U.S. first, followed by English in Australia, Canada and the United Kingdom, as well as German speakers in Germany, Gummi Hafsteinsson, a product lead at Google Assistant, says in a company blog post from Feb. 26. More languages will be added over the course of 2017. Google Assistant, the company’s answer to Apple’s Siri and Amazon’s Alexa, will automatically come to eligible Android phones with Google Play Services, and will also be available on Google partner phones. For example, LG’s G6, which was unveiled on Feb. 26 at Mobile World Congress in Barcelona, Spain, will be the first phone to offer Google Assistant. The feature leverages Google’s research in the field of machine-based natural language processing, which is used to power the Assistant’s speech recognition system. It can be launched with a long press of the Home button or by saying “OK Google”. It provides two-way, context-sensitive and conversational interactions between the user and device, as well as syncs across different devices and applications, such as Allo and Google Calendar. This marks yet another expansion into the mobile environment for Google, which is predicting that Assistant could reach “hundreds of millions” of devices. However, just under 31 per cent and slightly over one per cent of Android devices are currently using Marshmallow and Nougat respectively, the company says. Its earlier operating systems, KitKat and Lollipop account for over half of Android devices in use, but they are not getting Google Assistant at this time.